How does one test an installed cable plant and most components? How does insertion loss differ from OTDR testing? How do tests differ for cable plants, individual cables or patchcords and components? There are two distinct ways to test a cable plant and most components, using insertion loss or OTDR testing. Insertion loss refers to a test method that is similar to how a network actually transmits data through an optical fiber. A test source coupled to a launch cable injects a test signal into the fiber. The test signal will be attenuated by the connection into the cable plant under test, all the fiber in the link and every connection or splice. By using a power meter to measure the output of the test source and launch cable, then measure the signal at the far end, one calculates the loss as the difference between these two meter measurements. Insertion loss is a simple, direct way of measuring loss and if properly done accurately represents the loss of the cable plant that a typical transmission system will see. Insertion loss testing will work on any component or cable plant.The big issue for insertion loss testing is how to set the "0dB" reference - using one, two or three reference cables. In the next lesson, #5, we will cover testing by the instrument called an OTDR - optical time domain reflectometer - which uses a very different indirect method of testing fiber that provides different kinds of information than insertion loss testing. 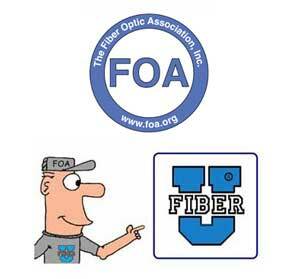 The OTDR sends a pulse down the fiber and looks at the light scattered by the fiber back to the OTDR to create a "snapshot" of the fiber. That snapshot can be analyzed to provide information about the length and loss of the fiber, but as an indirect method has several ways it differs from a direct insertion loss test. So this lesson will give you a good understanding of insertion loss testing of various components and discuss the uncertainty of measurements. While we call these "extra credit" you may find them very informative and useful for special testing issues. Special Applications/Hybrid Cables (A extension of the explanations in the "5 Ways" article/video that gives more explicit directions.